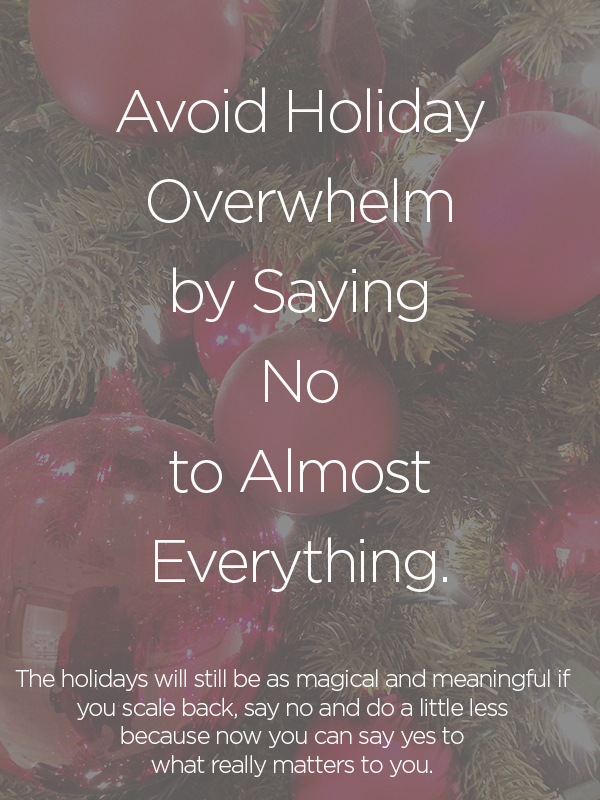 There are so many wonderful things about the holiday season and often along with all of that wonderfulness comes holiday overwhelm and decision fatigue. 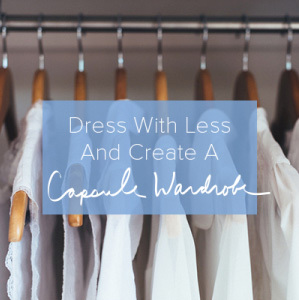 We are overwhelmed with the choices we have on a regular day but throw in holiday events, traditions, delicious foods, fancy outfits, invitations and special requests and it’s easy to understand the exhaustion we experience throughout the end of the year. Saying no is hard, so setting up some rules will help you make decisions with more ease and have the attention to engage in what you say yes to. Start by making a list of your non-negotiables. That way, when these things come up, it’s an easy no. I’m not hungrier because it’s Thanksgiving Day. I don’t pile my plate full of food on any other day, so why would I do that to myself because it’s a holiday? I’m also not going to spend the day in the kitchen making sure everything is perfect for the table. Instead, I’ll prioritize being with the people I’m spending the day with. Scale down the holiday meals. You’ll save money, waste less food and more importantly, you’ll be able to show up for the people you love and you won’t feel like a truck ran over you at the end of the day. Black Friday, Cyber Monday and any forced shopping situation. When I think back to the things I’ve purchased just because they were on sale, I remember that if the best thing about something is the price, I don’t need it. Say no to shopping for the best deal or buying things now because they are on sale that you might use later. I’m not suggesting you should overspend on items but be mindful about your motivation to purchase. Don’t buy just because someone told you today was the best day to buy. The best day for who? I enjoy sending thank you cards, and other thinking of you cards during the year, but holiday cards are just a little too much for me. It always turns into a bigger production than I imagine, and then they get lost in a sea of holiday cards. So, it’s a no. Look at your holiday traditions and the things you think you are supposed to do. If sending holiday cards is something that adds to your holiday experience, send them. If you are sending them out of obligation, just stop and see what happens. Through the rest of the year, I’ll be saying no to new work things. I won’t review new books, collaborate on new projects, or add anything else to my work plate. I’m doing enough. There will always be more. Will I miss out on something amazing? Maybe. Will my work and health suffer if I add more? Most likely. Say no to extra work stuff over the holidays and save your energy for the other extras. You are doing enough. There will always be more. I won’t buy new ornaments, outfits, festive dish ware or anything else I won’t want in my home post holiday (even though I think I want it in the name of holiday spirit). It’s not that I don’t think those glossy white plates with a gold foil stamped reindeer aren’t beautiful, or finding another sentimental ornament to add to the tree wouldn’t be somewhat meaningful. The simple truth is that I have enough. I have enough, and I’d rather spend my time being content with what I have instead of being in search of something I’m missing. New holiday gear is tempting but take a look at what you have. Is it enough? If it is, be grateful. If there is plenty, but you still want more, just know that it will never be enough. And it’s a no to all of these things too. Make a list of your yeses too. Years ago, I celebrated the holidays by spending money I didn’t have, by eating and drinking everything, staying up too late and by over-committing and over-extending. All the overs, all the more, all the burnout. I always got sick and I always felt badly about how I treated myself, especially in January when I had extra debt, weight, and fatigue to deal with. Now things are different. I do the holidays differently (like I do my life differently) … with more love and intention. I don’t want to “survive” the holiday season or “get through” it. I want to enjoy and embrace it. Build in extra time to take care of you, even if that means leaving the party early. If you aren’t sure how to take care of yourself, try one of these recommendations. I look forward to this program every year. Author, Glennon Doyle connects people who need help with people who can help, one connection at a time. Read this if you need extra help this holiday season. If you can help someone, visit Glennon’s site on November 13th to find a match. Learn more about how the program started and what it involves here. The holidays are a time to connect, but in order to bring my best to the people I love spending time with, I have to spend time alone. I don’t apologize for that. Long walks, hot baths, and books give me the alone time I need so I can give everyone else what they need. If you need alone time, and I think we all do, take it unapologetically. Coziness and candlelight, sipping hot tea and watching the snow fall. Finding Christmas PJ’s for my daughter’s puppy. Cuddling with my husband and watching The Holiday. Baking cookies for the people in our homeless community. I know they need more, but they deserve delight too. Handing a small bag or tin of homemade cookies to someone with nothing is everything. Enjoying the city holiday lights at 5:30 am when everyone is sleeping instead fighting the evening crowds. 31 Days of Gifts You so Deserve. I’m bringing this advent calendar for your inbox back again this year. Watch for an invitation for this delightful experience next week. I will be saying yes to delight this year. Make a list of what delights you. That’s your yes list. It’s been our Wintertime tradition to eat a big breakfast, head out to the slopes early to ski and leave the dishes unwashed in the sink. Sometimes I wash a few of them or feel bad for leaving them but this year, I’m leaving the dirty dishes behind guilt-free. The mountains are calling and the dishes can wait. What do you want to do instead of the dishes? That’s your yes list too. If you honor every request with a yes, you will compromise your health, family, peace of mind, and the joy of living your life. If you don’t say no, there will be nothing left of you to say yes to. You will find more time, freedom and energy when you start saying no. At first saying no might feel like you are missing out and hurting people’s feelings but after a while, you begin to see that by protecting your time and energy, you are able to better engage in and experience your yeses. Say yes to love, yes to delight and no to almost everything else. The holidays will still be as magical and meaningful if you scale back, say no and do a little less. You may even discover that because you decided to do things differently this year, the holidays are better than before. 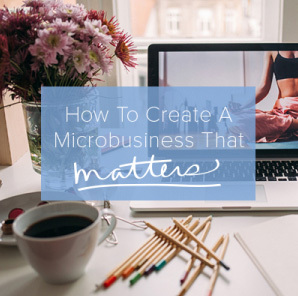 I’m hosting a webinar to share more about A Simple Year and to answer your questions today (11/7). If you are interested, please sign up here. If you can’t make the live call, sign up and I’ll send you the recording. 31 Days of Gifts!!!! You just made me so happy. Thank you. 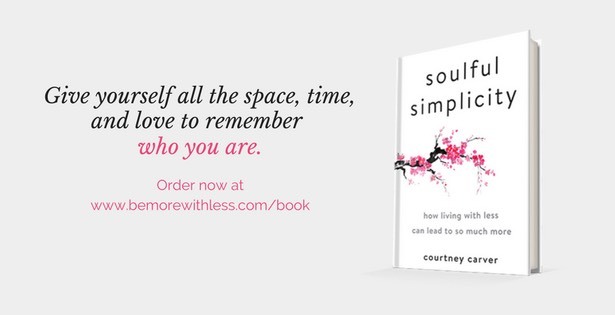 Hi Courtney, love your blog! This post reminds me to take a mindful approach to the holidays, even if that means changing up some “traditions”, especially with respect to meals. I like that you just said it straight out — our bodies don’t need more food just because it’s a holiday. Scaling down might run counter to some people’s idea of “fun,” but it really isn’t fun to feel overly full or experience the sugar highs/lows. We can still enjoy a special meal without it taking up all the space (physically or mentally) and save room for other things. Love this so much!!!! I had a bunch of ornaments in an online shopping cart that I thought I needed because they are on sale ~ just emptied my cart. I’m printing this post ~ so much good stuff. Thank you ~ you are an inspiration. Hi Courtney. I have been reading your website for a long time but this is my first comment. I have started a busy boycott because I believe I am on the edge of burning out. I wanted to thank you for your book and your blog. Your words are such a comfort, and even though I do not know you and we live in different countries, I feel like you are supporting me. Fantastic advice as always! This is something I definitely need to do! Great article. Yes to all of it. Leaving breakfast dishes in the sink until evening?! Apparently I’ve lived the blissful slow life forever! Turning down new opportunities because you’re already enough, is revolutionary! I like it, but it makes me nervous. Such a deeply brainwashed state of FOMO, I have. Sigh. It still persist about some issues. My neighbor gets upscale Christmas catalogs. Every year, I teach a class to make a similar one from free items. This year we made Victorian style ornaments from scraps of paper, old cards, cardboard and parts of broken puzzles. I have plans and supplies for the next 2 years. I have 2 plastic shoeboxes for the interesting stuff and cardboard scraps are easy to get. Nothing is new except glue. Now that my 2018 crafting is over, I went through my supplies and gave away bags of ribbon, paper, buttons, etc. I am keeping only a few things because more is always out there. I would like to try a different craft for 2019 but first I need to get rid of more stuff.